Want to get spooked with a creepy, make the hair on your neck stand up, kind of movie? Then check out the supernatural ghost story “Mama” directed by new comer Andres Mushietti. This is the story of an overzealous, possessive mother that goes overboard on keeping and controlling her young. To top it off she does it all from the great beyond. Two little girls are abandoned in a cabin in the woods after both their parents die. Their Uncle Lucas (Nikolaj Coster-Waldau) and his girlfriend Annabel (Jessica Chastain) have been on a hunt for five years searching for the lost girls. Finally the cabin is discovered where the girls have somehow survived on pitted cherries and eating moths among other strange survival techniques. But, who taught the children to survive is a mystery. Getting Victoria (Megan Charpentier) and her younger sister Lilly (Isabelle) under the care of Doctor Dreyfuss (Daniel Kash), the couple begins working on raising the girls and giving them a normal life. Annabel reluctantly takes on the responsibility for being a substitute mother for Victoria and Lilly after their uncle has a bad fall and lands up in the coma. Alone at home with the two sisters, Annabel notices things start going bump in the night. A freaked out Annabel is convinced that something or someone is in the house and wants the girls. She confides her suspicions in Dr. Dreyfuss who tries to convince Annabel that the oldest may be suffering from a personality disorder and it is her behavior that is what is causing the disturbances in the house. The good doctor does get curious as he discovers details of a story about someone named Mama that Victoria is able to talk about under hypnosis. Convinced there is no way an 8-year-old who has been hiding in the woods could possibly know a story in such detail, that she says was shown to her in her dreams, the psychiatrist sets out to research local historical records using the information he retrieved from the child and begins to discover the truth about Mama’s real identity. Executive producer Guillermo del Toro, known for creating visual imagery that produces dark, eerie moods in films like “Pan’s Labyrinth” and “The Devil’s Backbone”, adds his own special touches bringing forth that oh so ominous feeling that something is lurking in the dark. The children display odd behavior when they slither around the house observing their new surroundings. Twitching and jerking nervously, the youngest crawls on all fours around the house quiet as mouse when she suddenly appears scaring the pants of anyone looking into the eyes of the weird little lady. Lily’s actions and body language gives a most unsettling feeling. Strange patterns on the wall, bugs showing up out of nowhere, and a long-limbed lanky stick like apparition wearing what looks to be long flowing robes and has a head resembling that of Medusa (a character from Greek mythology) unexpectedly popping up will cause a jolt, a jump, a gasp, and then a laugh by those watching. The strongest performance is given by Jessica Chastain as the tattooed rock star wannabe that is extremely squeamish at the thought of becoming a mom. Chastain slowly moves through each scene allowing her character to overcome her hesitation and convincingly brings out the mother instinct, and ultimately will stop at nothing to protect the girls from whatever is haunting them. Nikoloj Coster-Waldau plays a role that is a far cry from the crazed character, Ser Jaime Lannister that he plays on the HBO series “Game of Thrones.” Nikoloj’s plays the compassionate uncle nicely but it would have been nice to see more of his character developing a relationship with his nieces. About a third of the way into the story, Uncle Jeffery is put in hospital and is out of the picture so convincing the audience of a loving relationship with Victoria and Lilly never really takes off. The “Game of Thrones” actor has great potential but does not get to show it off much in this movie. “Mama” does not rely on blood or gore to get its full effect and adequately uses camera angles, lighting, and music to give us the chills. For the most part, there is enough odd sinister action going on to hold your attention. Once we get the end of the this dark tale and the secret behind the haunting is revealed, the film becomes very contrived and completely falls apart even though there is a somewhat surprise ending. 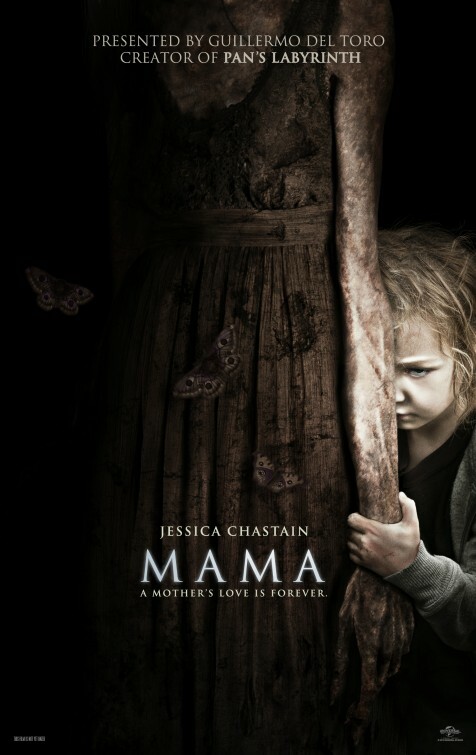 The explanation and the conclusion to “Mama” feels very rushed and thrown together. Some may find themselves shrugging there shoulders completely unsatisfied and thinking “That’s it?” once the secret of the haunting is uncovered. However, if you overlook the chopped up and forced ending, there are plenty of scary moments thrown in to make you want to keep the lights on when you go home.